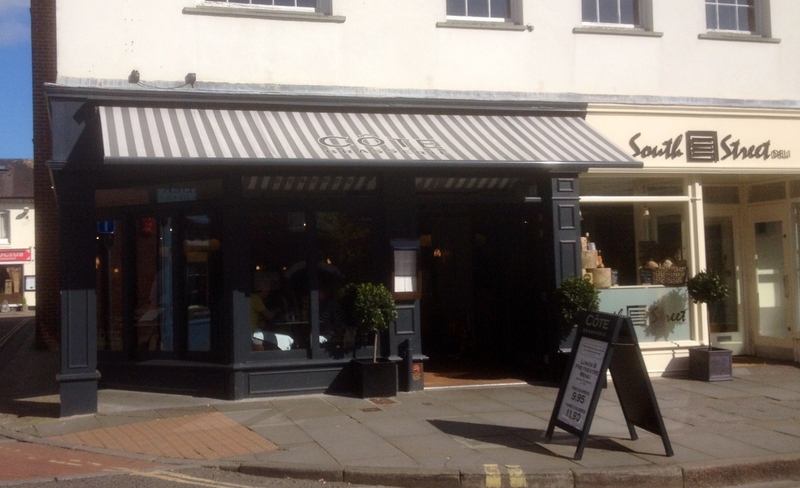 Côte Brasserie in the cathedral town of Chichester, is just one of a few dotted around England – there’s one in Wales too. One sunny day when Geoff and I happened to be in this charming West Sussex town, we decided to ‘check it out’ as they say. We had already paid a visit to the South Street Deli next door that morning, where we enjoyed a coffee and a Rocky Road and so after a spot of shopping we were looking for somewhere to eat for lunch which we hadn’t been to before. Amelie & Friends and Bill’s are both favourites of ours whenever we’re in Chichester, but this day we wanted something new – for the blog too of course. Neither of us wanted a starter, however all the dishes in that section sounded good to me. I had a nice glass of Sauvignon Blanc and Geoffrey, feeling a little thirsty had a coke. A bottle of ‘complimentary filtered tap water’ was also given to us. We both decided upon the steak frites. The steak was chargrilled and beaten to make it thin and to tenderise it, thus taking only a minute to cook, making it a ‘minute steak’. This had a supplement of £2. 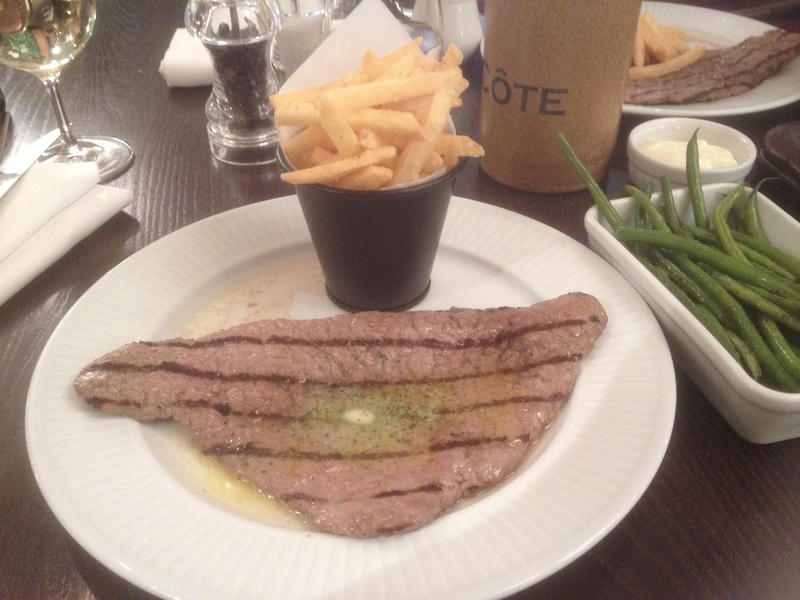 The steak was very large and incredibly thin. Unfortunately it was also a little cold, but still very tasty with no fat or gristle. I had garlic butter on mine whilst Geoff had peppercorn sauce. 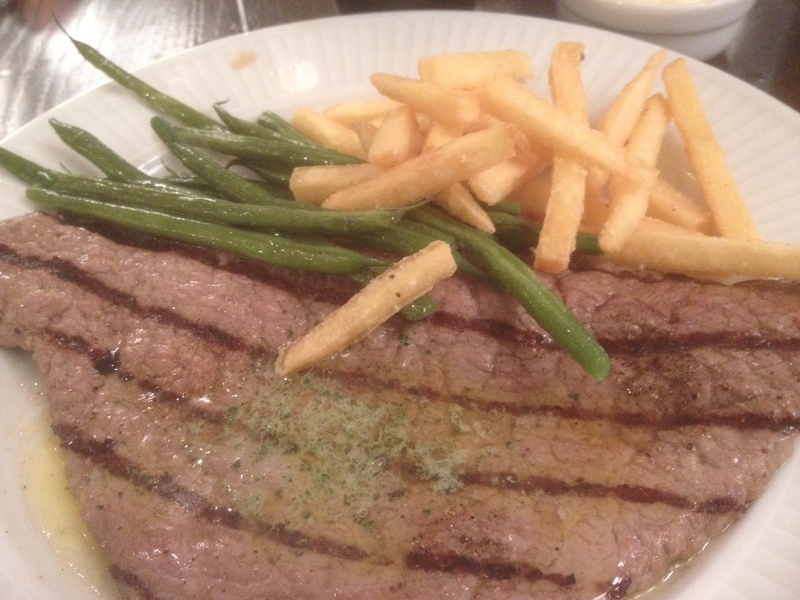 This came served with skinny chips and we also shared a side order of French beans. For dessert we were going to order two and share them both but the dark chocolate pot with crème fraîche I had ordered was quite small and so I decided to keep it all to myself. 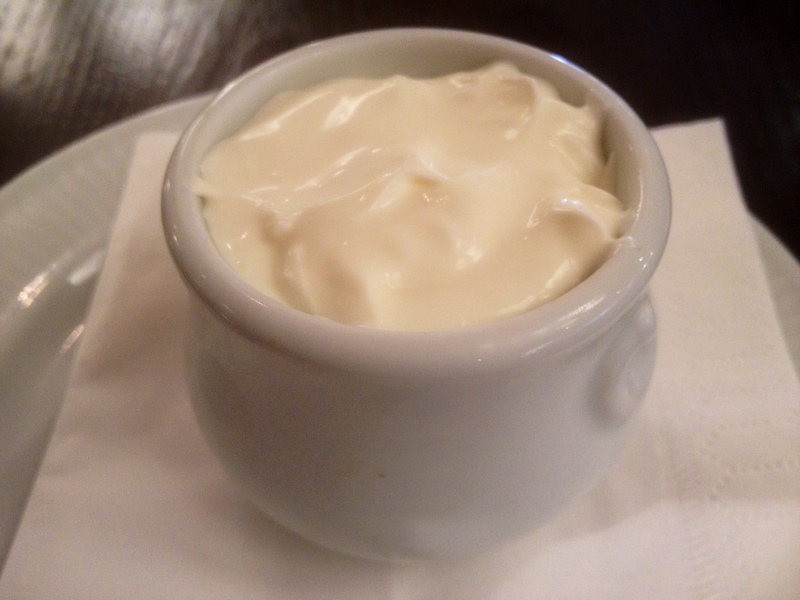 At first I thought it was a pot of crème fraîche which would accompany my chocolate dessert, but the chocolate was hiding underneath it. 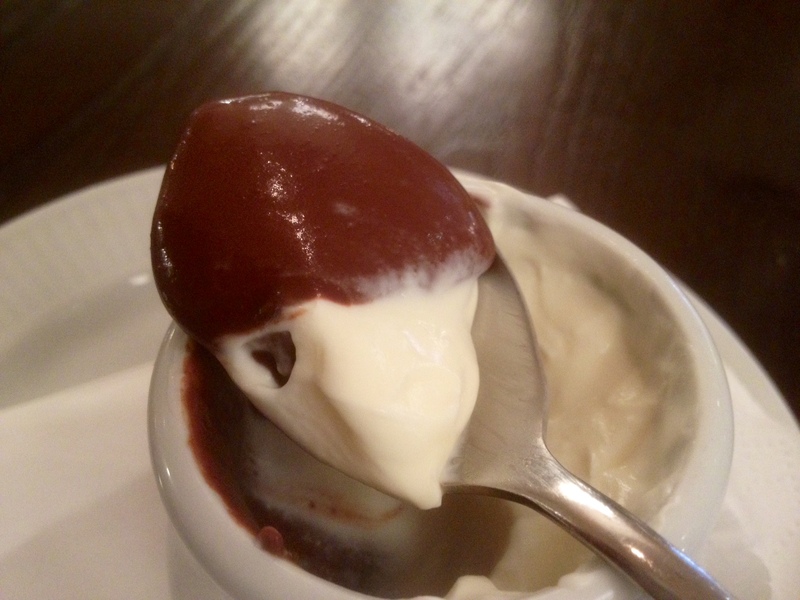 The chocolate was very tasty and went well with the fairly sour crème fraîche. I tend to have it instead of cream at home now because it seems to go well with most things. I like the sweet/sour combination. The chocolate was quite rich, it wasn’t smooth, it had a fairly ‘grainy’ texture to it. It was still rather nice though. 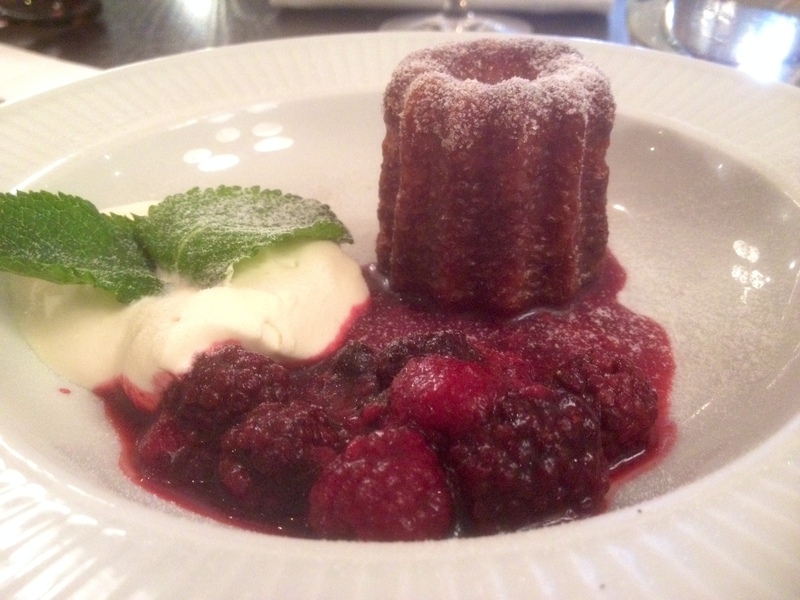 Geoff went for the Canelé de Bordeaux: Warm vanilla and rum canelé (Bordeax style caramelized pastry) served with berry compote and Crème Chantilly. I had a little taste of it and it was very nice too, although I preferred my chocolate pot. 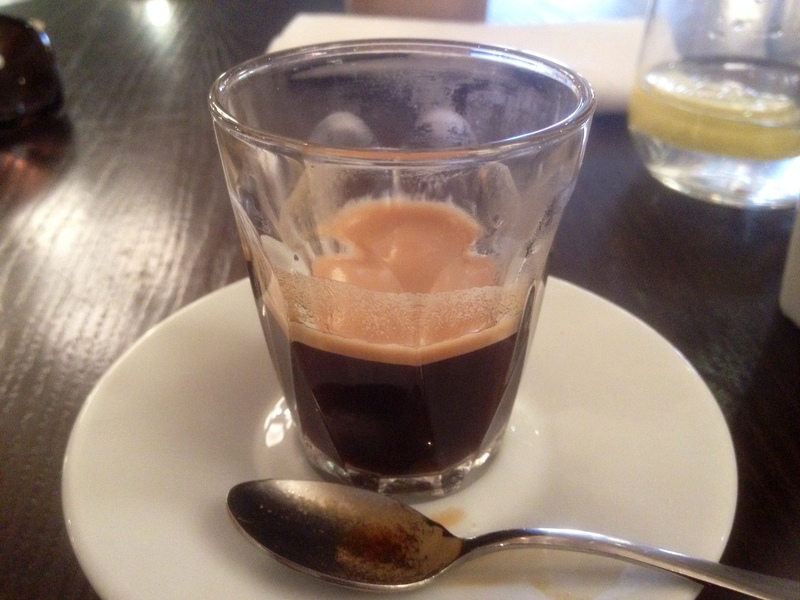 Of course, the meal was finished off with an espresso. This was served in a little glass tumbler. Geoff prefers cups, I rather like these little tumblers. 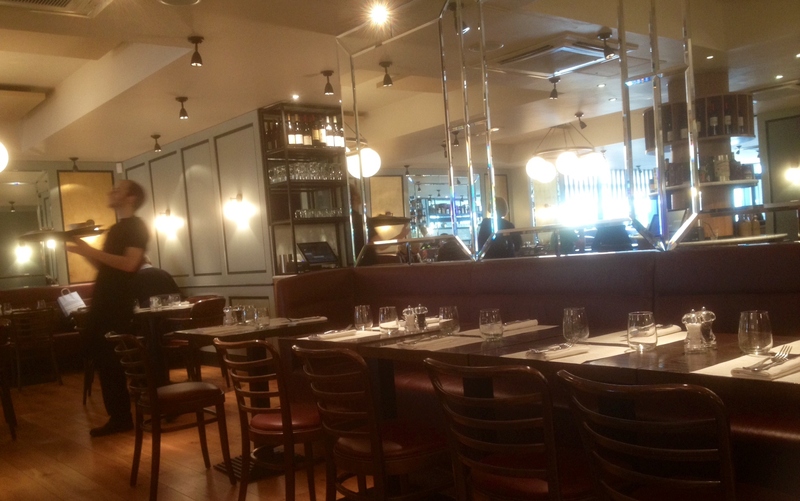 The ambience in Côte Brasserie was very nice, families, friends and couples were all eating there and the staff were all very friendly. It’s quite a large restaurant so can accommodate lots of people, great for a family get together. 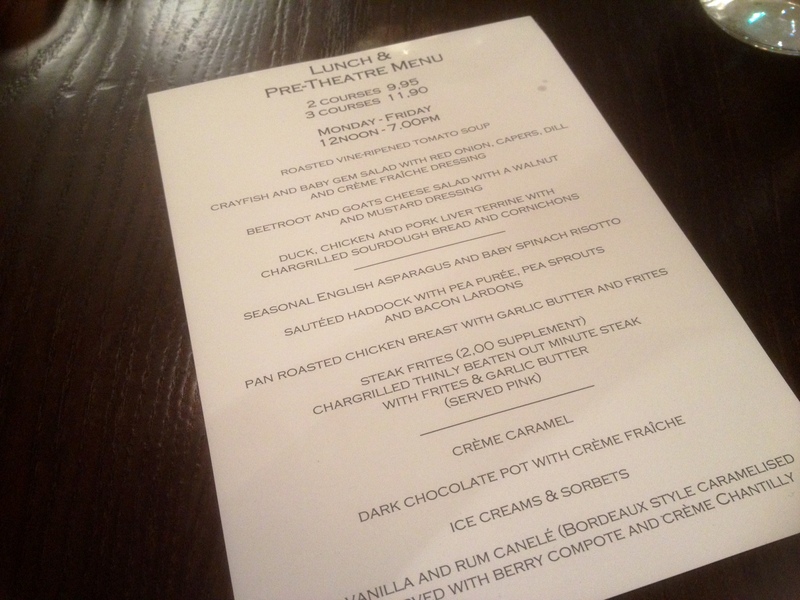 And the food, for the price of just shy of £10 for two courses and just under £12 for three was pretty good value.